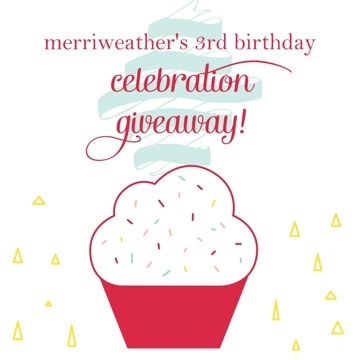 Merriweather Council turns 3 years old TODAY!! On May 29th 2010, my Etsy shop opened and the rest is history. In order to celebrate this joyous occasion, I am gifting-away three goody bags full of handmade awesomeness. I want to share and support handmade for Merriweather’s birthday so I have purchased some wonderful things from some of my favorite sellers! (Of course, not ALL of my favorite sellers because for some reason I am not a billionaire yet.) Each gift bag includes items from at least 6 (because who knows, I might add more) handmade sellers, from a variety of categories. The goody bags also include merriweather items, of course! I’m SO jazzed about these, I have spent a lot of time hand picking each piece and I am actually feeling sort of dumb because I didn’t buy 4 of each things, just 3. In order to maintain the element of surprise, I’d like to keep it at that! The gift away is open to friends and fans abroad as well. A winner will be chosen at random in one week! Leave all entry comments on this post. Repin this pin on Pinterest, leave a comment here with a link to your pin. Post about this gift-away on your blog with a link back here (3 entries) and leave a comment here with a link to your post. Like Merriweather Council on Facebook, leave a comment here saying you did it! Follow @merriweatherc on twitter, leave a comment here with your twitter handle. Follow @merriweatherc on Pinterest, leave a comment here with your Pinterest username. Already like or follow on Twitter, Instagram or Pinterest? Leave a comment saying so with your name/ username and get 2 entries! Subscribe to become an esteemed council member and leave a comment saying you did so! Come Celebrate a Birthday and See Lots of My Hoops and Such! whoooo im sooo stoked for you!